Getting it right with the mold design pays off with performance and durability in production. 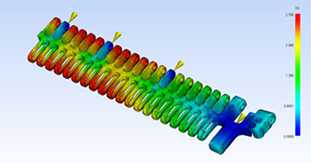 Our Engineering staff thoroughly reviews the feasibility for molding and performs a Flow Simulation Analysis to ensure mold designs meet our high standards. Using the expertise of multiple domestic and off-shore mold builders we can ensure our customers receive high quality / durable molds and value for their investments.